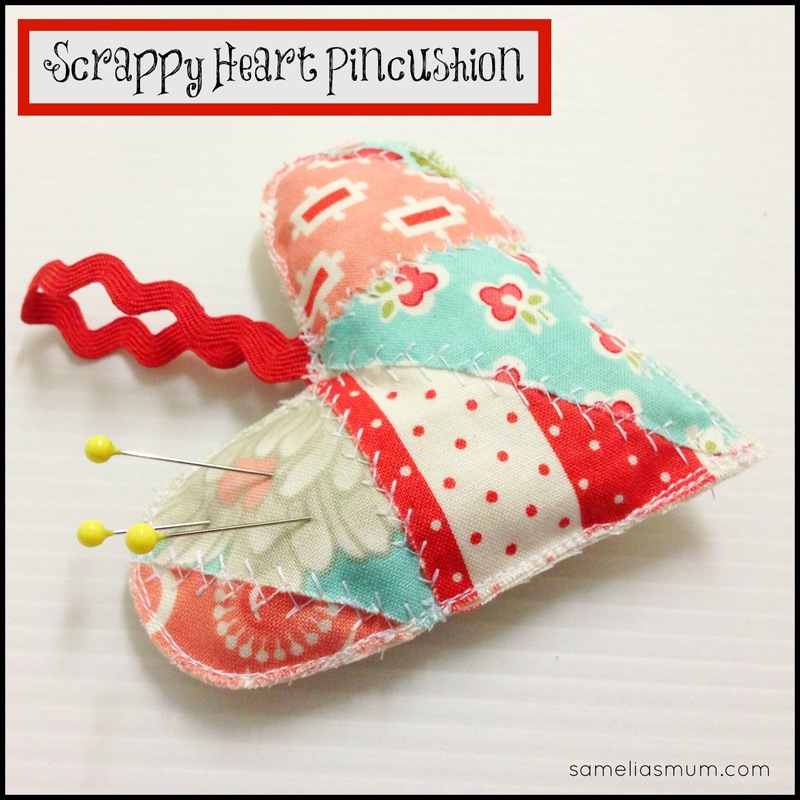 The first project in the 52 Week Scrap Challenge is the Scrappy Heart Pincushion. I love pincushions and honestly couldn’t resist making one for my first scrap challenge project. This project is just perfect for those itty bitty, teeny weeny, little scraps. Making this pincushion was super, SUPER easy. I had some little triangles of Vintage Modern from a previous project, which I just couldn’t part with. Start with a 5” square of a base fabric. I used a cream solid which I had on hand. Lay out the scraps on top of your base fabric. You don’t want to leave any gaps where the base fabric is visible. It’s not a necessary step, but I used a little bit of glue to hold the scrap fabrics in place. Sew the fabrics down to the base fabric. My machine has so many decorative stitches, which I never use, so I thought, why not? Next step is to draw cut this lovely appliqued square into a heart shape. You can either flip it over and draw your heart free hand onto the back of the base fabric, or you can do as I did and create a little heart shaped template. Pin it to the top and cut around it. Choose another piece of fabric approximately 5” square. Place the background fabric right side down and the heart on top, right side up. If you plan on hanging your pincushion, now is the time to place your ric-rac or ribbon. I’ve added some lovely red ric-rac on my pincushion - I like to hang my pincushion on my sewing machine, so that it’s right where I need it, when I need it. Sew around the heart all the way around leaving a couple of inches to fill the pincushion. I just use polyfil, but crushed walnuts are fantastic too. Once the pincushion is filled, sew the remaining couple of inches. Cut around the heart and there you have it. A heart shaped pincushion, made with some favourite scraps of fabric… and all in under 30 minutes. If you make a scrappy heart pin cushion, we’d all love to see it. Please post images to the 52 Week Scrap Challenge on Facebook. If you blog about it, please share the URL in the Linky with your comment below. Oh so sweet and easy peasy. A great start to the Scrap Challenge Anorina!! You can never have too many pincushions. I love the heart a lot. I had a look on my DH's facebook (I don't have one) But coulkdn't see what the scrappy challenge involved. What a sweet little heart!! a great idea for scraps! What a good idea. I have started sewing some hearts today, although they're not finished yet, I'll link them up when they are. Always looking for some new ideas for scraps. Such a great idea, lots of fun ahead for the next 52 weeks. what is the address of the facebook page for posting the pics? Well, I am off to do the heart. I have a box of scraps ready to go. Darling pincushion! I have lots of scraps and what a great way to use even the smallest pieces. Thank you for a great tutorial and can't wait to see more! My stitching bug is urging to the sewing machine and I just found this 52 weeks of scraps which I have.....so I plan to join in. Looking forward to catch up with everyone. can't wait to get started on my first pincushion project!